The circumstances in which people are born, grow up, live, work, and age shape health in powerful ways. One’s social and physical environment, access to a quality education and health services, and socio-economic status collectively have a major influence on their quality of life. 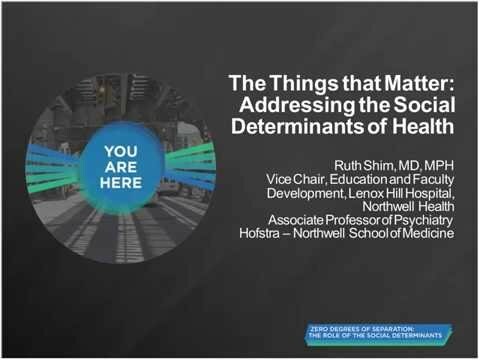 This webinar provides a lens through which to view services to populations impacted by harmful social and environmental factors and their impact on the well-being of individuals and communities. This webinar will challenge participants to rethink cross-system issues and consider clinical and policy interventions that can have long lasting, positive impacts on a person’s holistic self and well-being.